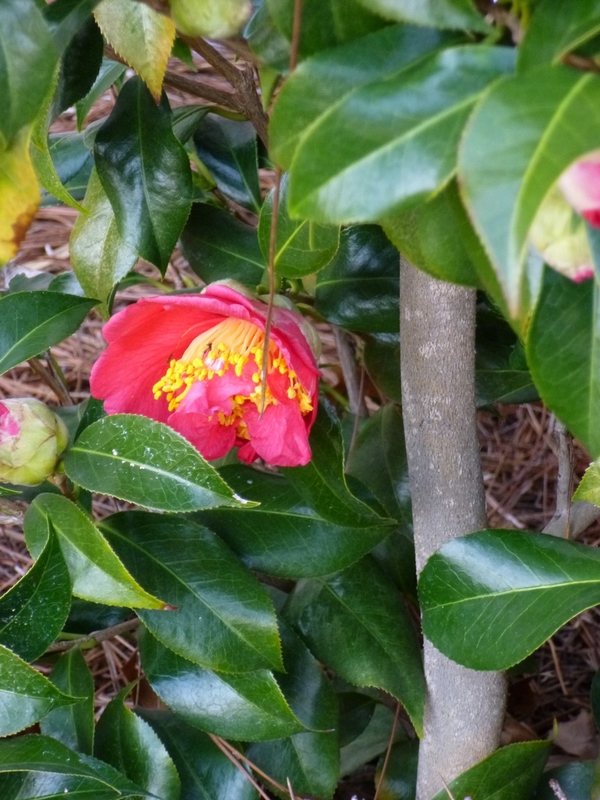 A lone camellia bloom and lustrous dark green foliage brightens an otherwise drab February day. Another blast of cold air (highs in 30s) is approaching this week. I'm not particularly keen on garden work when it's cold and blustery outdoors, so I haven't been doing much in the garden except laying more pine straw mulch. That said, in the past few days I've ventured out to capture a few highlights from the February garden. For instance, one of the camellia bushes has started blooming! We have five camellias - three that were here when we moved in and two Camellia sasanqua (Kanjiro and Pink-a-Boo) that I added last autumn. Four of the camellias bloomed back in November and December. The fifth Camellia teased with big fat buds for the last month or two and finally has started bursting forth with flowers. It is a welcome sight when so much of the rest of the garden is still brown and austere. 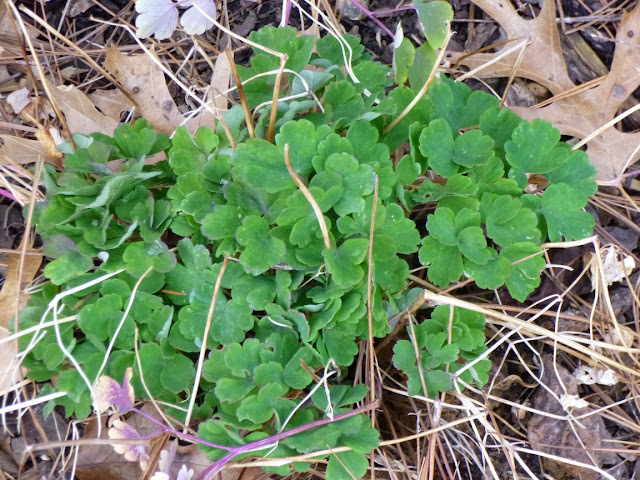 It has also been heartening to watch as the aquilegia vulgaris "Winky" puts on new foliage. I have to say that I was pretty impressed with aquilegia this year. The foliage does get tattered (by slugs and leaf miners, I presume?) in the summer, but I cut it back twice last year and each time it produced a fresh flush of foliage. In autumn, the foliage held green and proud into December. And when that foliage finally started to fade away gracefully, it has quickly been replaced by new green growth! Why wait until spring? Aquilegia is ready for new growth now! I went for the 'natural' look this winter and let last year's aquilegia foliage fade away gracefully. You can still see some of it crumpled next to the new foliage. I even think the tans and purples of last year's foliage have their own charm. But if they persist and are still noticeable next month, I may tidy them up a little. I'm planning to add more aquilegia to the garden in a month or two - both A. vulgaris and A. canadensis. Hopefully both will fare well and I'll be able to share some beautiful photos with you all. I have a lot of Columbine coming up with new growth. I have a few doubles that are really great. Can't beat a Camellia bloom! And yes, Camellias certainly do have lovely blooms! Thanks for your comment, Donna. We don't usually have much snow cover in Tennessee. From what I understand, the lack of snow is actually tougher on plants (even if it's easier on humans) because they can't benefit from the insulation that snow provides. Oh my gosh! I was about to step away from my computer when I read your headline and I had to see your Camellias. Lucky you! Sigh... Enjoy those first signs of spring! Aaron, if your camellia's blooming, mine here in Connecticut can't be far behind. Enjoy this cold-weather treat. Thanks, Lee. Hope Spring arrives soon in your neck of the woods! I was so embarrassed to buy a plant called Pink-a-Boo, but there were LOTS of bees on the P-a-B when I saw it at the nursery and I do prioritize creating a bee-friendly landscape. Gardening Gear -- Best Gloves? Would You Plant ... Wild Ginger?